Villa VISTA FIRST LINE OF SEA. Rent in Spain of a house of 200 m2 composed by 5 double bedrooms, 2 BATHROOMS, 1 SHOWERROOM, CAR PARK FOR 3 CARS, on plot of land of 1000 m2. Villa SERRAMAR Rent in Spain of an individual house of 5 double bedrooms, 3 bathrooms, swimming pool deprived with fountain(water jet) for massage, air bubble typifies Jacuzzi and swims against currant, on plot of land of 700 M2. 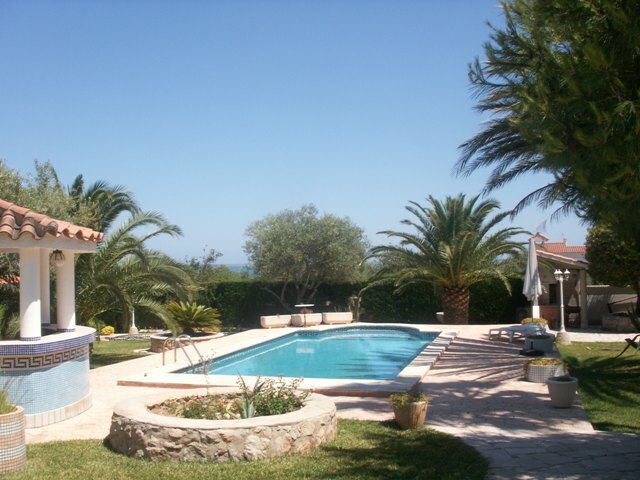 Villa EVISA Rent in Spain of an individual house of 3 double bedrooms, private swimming pool, on plot of land of 1350 M2. Residence Terra i Cel Rent in Spain of a recent apartment of 90 m2 composed of 3 bedrooms, 2 bathroom and balcony. Résidence PLAYA SOL I - II : For rent in Spain in a residence in front of the sea, apartments of 1, 2 and 3 bedrooms with car park, comunity swimming-pool and area for children (HIGH STANDING). For 4/5 persons maximum (depending of the housing). VILLA PLAYA APARTMENT RIGHT AND LEFT Rent in Spain of 2 apartments of 2 bedrooms in house with community swimming pool and barbecue, far from 100 m. of sea. Residence Mediterrani 1 and 2 Rent in Spain of 2 new apartments of HIGH STANDING about 70 m2, situated in the last floor composed of 2 bedrooms with private terrace about 35 m2. Community swimming pool and car park. only 350 m. from beaches. Residence GOLDEN BEACH Rent in Spain of new apartments of HIGH STANDING. The ground foor housing has a private garden, the first floor housings have terraces of 15 m2 and the attic ones have a private solarium of 60 or 80 m2 The residence possesses a community swimming pool and each appartments have a car park. Only 350 m. from beaches. For 4 or 6 persons maximum depending of the housing.